The TUHP 149 is the AgustaWestland candidate for the Turkish Utility Helicopter Programme (TUHP). It is a new generation 8.1 ton medium lift helicopter with inherent multi-role capabilities designed to meet modern military requirements. The helicopter features a state-of-the-art ballistic tolerant composite high efficiency fully articulated five-blade main rotor and a four-bladed tail rotor granting smooth riding together with high speed and low vibration and noise signature. The roomy unobstructed cabin, capable of hosting up to 18 troops, has large sliding doors allowing easy and quick access and egress for troops and the loading of bulky equipment. With a fully digitised avionics with open architecture and fully integrated mission equipment, a modern glass cockpit and a 4-axis auto-pilot reducing pilot workload and helping the crew concentrate on the mission, the TUHP 149 is specifically designed for the modern battlefield with redundant critical systems. 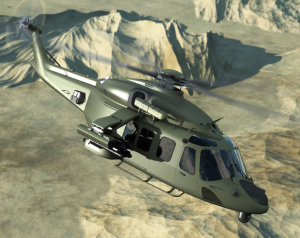 The helicopter is characterised by a rugged construction incorporating crashworthy features, armoured pilot seats, crashworthy troop seats, and self sealing fuel tanks to maximise survivability. Easy ground handling and taxiing as well as operation from unprepared terrain is made possible by the heavy-duty nose-wheel high energy absorbing, semi-retractable landing gear for higher speed. Two 2,000 sph GE CT7-2E1 turboshafts engines with FADEC deliver high performance in hot and high conditions with outstanding one engine inoperative capabilities. The TUHP 149 is endowed with the latest all weather day-night operational capabilities, dedicated avionics and a NVG-compatible cockpit while icing protection will be available as an option. The TUHP 149, by its open architecture design, would be fitted with role kit equipment and systems according to customer demand to fulfil the existing as well as prospective new roles undertaken by the final operator. The TUHP 149 features low signatures (acoustic, IR and radar) and an advanced integrated self-protection suite. Advanced sensors, communication and data sharing systems provide the crew with high situational awareness and enable the TUHP 149 to perform the mission in the today and tomorrow network-centric environments. The aircraft can be configured to carry a variety of multiply combined stores, comprising external auxiliary tanks and weapon systems, on external pylons including rocket launchers, air-to-surface and machine-guns. Pintle-mounted machine-guns can be fitted on fixed frame windows or in relation to the doors. Structural provisions for the installation of external cargo hook, heavy duty rescue hoist and all the other mission dependent equipments are provided. The TUHP 149, thanks to the modular concept design for rapid role re-configuration, is perfectly suited to perform an impressive number of duties such as troop transport, battlefield and logistic operations, fire support, SAR and combat SAR, special forces operations, reconnaissance, surveillance, CASEVAC, command control & communication, external load lifting as well as VIP military transport. The TUHP 149 has been conceived to ease support services and reduce cost of ownership optimizing aircraft effectiveness and minimizing maintenance requirements within the whole helicopter life-cycle and dedicated support and training services package can be provided on a cost effective through life support basis. A full “Level D” flight simulator is also envisaged.